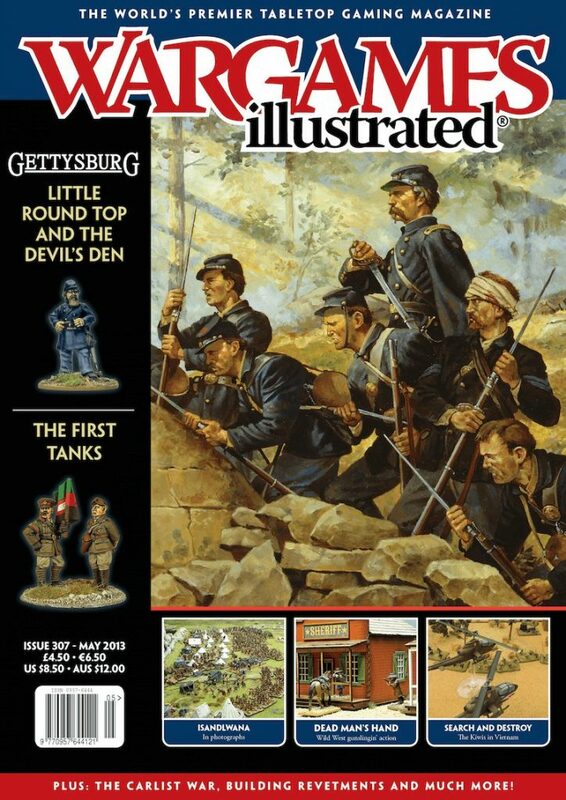 The May 2013 issue of Wargames Illustrated. Featuring the theme of Gettysburg Little Round Top And The Devil’s Den. One hundred and fifty years after the events that took place near a small town in Pennsylvania turned Gettysburg into one of the most famous battlefields in the world, we refight a section of that battle; the fight for the Devil’s Den. Games designer (Foundry’s Bull Run to Gettysburg) David Bickley umpires a game that pitches the Union soldiers in a desperate struggle to defend their position in and around this iconic section of the battlefield. Battlefront Studio team members Phil and Victor report on their Tour Of Duty: Search and Destroy game, in which a New Zealand Rifle Company faced off against a Vietnamese Infantry Battalion. The second battle using our 2013 Gettysburg Sesquicentennial Show Table, sees games designer Barry Hilton playtesting his Republic to Empire ACW variant rules, as the Rebel commander seeking to shift the Union troops (Col. Joshua Chamberlain of 20th Maine and all) from their lofty, and seemingly impenetrable position, on top of Little Round Top. World War One enthusiast Chris Peers presents the latest article in our Evolution of the Tank series, this time looking at what we, today, recognize as the first actual ‘tanks’. He describes their introduction to the battlefield, and the struggles to come to grips with their strengths and weaknesses. Our Great Warriors series returns with a look at the Vikings, accompanied by some shots of new figures from Shieldwall Miniatures. Battlefront designer Mike Haught shares his thoughts on modeling an Air Cav force for Tour Of Duty. Nick Buxey gives us a tour of the latest gaming table (complete with wonderful terrain, armies, and characterful vignettes) to come out of the ‘Like a Stonewall’ wargames group, displayed last year at the Derby Worlds show. Helicopters and fixed-wing aircraft were usually parked in revetments to protect them from grenade, mortar and rocket fire. They look great on the wargames table, and in this article Mike Haught tells you how you can make them for yours. Hot on the heels of Great Escape Games release of their new Western Gunfight rules, we road test the game with one of the authors. Pat Smith is an enthusiastic wargamer, photographer, and blogger. Take a quick look around his blog and you’ll see he has a great eye for a striking photo. Pat has kindly shared this, the first part of his two-part, ‘photo-essay’ on the terrible events of 22 January, 1879, with us.